What is meaning of Accelerating Speed To Proficiency or Accelerating Time to Proficiency? This article defines the business metrics like proficiency, speed to proficiency, time to proficiency, time to competence, accelerating time to proficiency, accelerating speed to proficiency and accelerated proficiency in a well-rounded description based on research. This article shares the research findings in one study and describes 3 powerful workplace learning strategies which have proven to shorten time to proficiency of employees and explains a model to shorten time to proficiency leveraging these strategies. This research study revealed 5 powerful classroom-based instructional strategies to accelerate speed to proficiency of employees in complex job skills. Segmentation of tasks, self-guided pre-work, scenario-based contextualization, emotional loading/involvement and time-spaced chunked sessions. This article analyzes typical proficiency curve and suggests 4 potential approaches that can accelerate proficiency in workplace skills. Accelerate proficiency-based training, accelerate on-the-job experience, accelerate proficiency with restructured training and combining multiple approaches. In this research-based article, an instructional design model and 9 most promising e-learning methods are described which can be used to design a curriculum to accelerate proficiency at the workplace. This article describes guidelines to use an intuitive and practical 4-tier model for measurement of technical training effectiveness through 4 simple indices: training reaction index, improvement index, effectiveness index and impact trends. 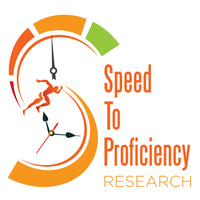 This research study reports 5 powerful e-learning strategies that can accelerate time to proficiency in complex cognitive skills: Experience-rich multi-technology mix, Time-spaced micro-learning content, Scenario-based contextualization, On-demand performance support systems, and Optimally sequenced e-learning path. Through 6 research-based guidelines, this article explains why it is important to acquire complex problem solving in today’s job environment and how training experts can design a training curriculum that ensures acquiring complex problem solving skills in any complex domain. This article explains how to rapidly accelerating expertise and behavior change using a powerful methodology of simulating rapidized failure cycles in a compressed time frame. Among several models for training design, the “Developing Expertise” Model by Sternberg (1999) is quite useful to define the training strategies. The main feature of this model is that it postulated that ‘expertise’ is trainable – however, required correct orchestration of the training strategies. The buzz word “accelerated expertise” has drawn a lot of research and business interest. Exploring 9 Models from Research: Can Expertise be Accelerated? Accelerated expertise has been talk-of-the-town in academic circle lately. Now business world has started seeing the need for the expertise of their employees to be accelerated. In general, building expertise takes a long time. One of the challenge training and learning designers face is developing curriculum and strategies that are meant to advance the learners towards a higher level of expertise in skills learned. 70:20:10 framework has seen its induction in several organizations. I got a chance to have a conversation with Dr. Charles Jennings, a learning thought leader and advocate of 70:20:10 framework to investigate the potential this model hold to accelerate employee workplace learning and performance. Back in October 2014, I had a pleasure of an interview with Dr. Ruth Clark exploring her views about certain training strategies to building expertise in problem-solving skills and potentially accelerate it. What is this time to proficiency metrics anyway? Before we talk about time to proficiency metrics in the business world, we need to recognize the market forces such as time to market pressures in terms of how those metrics shape the pace of business. A major topic in expertise studies is the stages a novice pass through to become an expert and attain skills beyond expertise. Developing newbie employees in any organization is a prime business goal. How does an individual acquire unconscious competence? Skill acquisition towards higher level competence kept me fascinated for years. While developing my doctorate literature review, I started out with some research on models of expertise/competence development. Mastery Demystified: How Does a Novice Develop into Mastery? The process of skill development that could explain how a novice develops mastery in certain specific skills, has attracted a great research focus for a long while.